Turn your bathroom into a spa built for two with this iconic combination tub. Sit side by side with your partner as you treat yourselves to a hydromassage provided by the eight high-pressure water jets and the soothing effects provided by fizzy bubbles the 25 air injectors create. 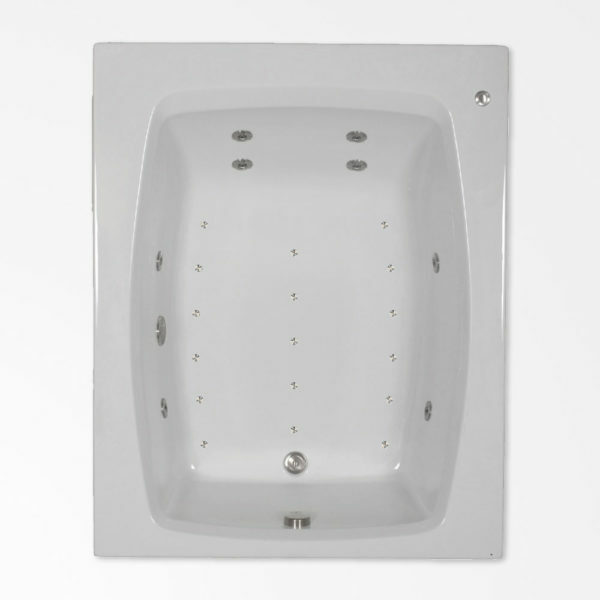 Its extended width provides enough room for two bathers, yet its 60-inch width lends itself well to standard tub installations. Put it in your shower alcove or make it a stand-alone tub in an island if you have the space. With its simple, crisp design this tub is a modern classic. The side curves of the interior well soften the rectangular edges of the deck. The bathing well and deck are free from anything that would detract from the clean lines of the tub, making it easy to clean and maintain. Enjoy the amenities of a spa from the convenience of your own home. The 60 x 48 combination tub is the perfect fit for contemporary homes. © Copyright 2017, COMFORTFLO, INCORPORATED. All Rights Reserved. COMFORTFLO, INCORPORATED produces quality products under the Comfortflo Whirlpool Baths and Accessories Trademark. Elegant single and 2 person acrylic whirlpool tubs. Our Whirlpool baths use spa jets for hydrotherapy. Designed by digitalstyle.